GET TO KNOW THE LITERARY LEGEND! 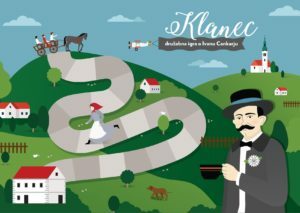 The players set off up the klanec (hill) and through questions and activities, they get to know Ivan Cankar’s life and works. 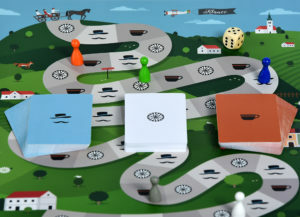 The game has been designed as a teaching accessory, as an enjoyable introduction to Cankar or as a revision of the previous knowledge about him. It presents Cankar as an important novelist and dramatist as well as an original personality. Into a foreign language class, it brings an important piece of the Slovene culture. 90 activity cards where you have to describe words from the titles of Cankar’s works verbal, pantomimic or by drawing. In the box, there are also five meeples and a dice, a board and instructions. The game can be played in 2-5 teams with at least 2 players each or by 2-5 individual players. If it is played in a class, you can use the cards in other ways as well, e.g. as a quiz, putting life facts in the chronological order, writing a short story etc., so students are actively involved in Cankar’s literary world. 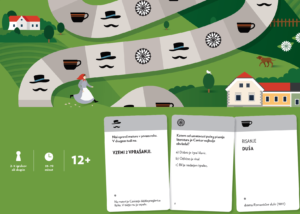 By selecting the cards, teacher can adapt the game to the learning goals and the students’ ability. Klanec is a fun bonding game which encourages communication and a healthy measure of competitiveness between the players.